Identifying a hawk can be difficult when you get only a quick glimpse or two. Sometimes other birds may resemble hawks in some ways, like soaring on broad wings. It helps to combine any available clues to figure out what kind of hawk you're spotting. In some cases you can rule out a species based on a criterion such as geographic location, or positively identify a species by a distinctive feature of plumage or behavior. The ranges of hawks vary by location, and by season. The rough-legged hawk winters in most of the continental U.S. except the southeast. The Cascades Raptor Center describes its summer breeding range as reaching the far northern parts of Canada and Alaska, separated from the winter range by a wide migration zone. You're not likely to see one in the southern range out of season. If you're east of the Mississippi River, you might spot a red-shouldered hawk, or a broad-winged hawk with its high-pitched whistling call. In western states, you might spot the ferruginous hawk with its rusty-red back, or a sharp-shinned hawk. Red-tailed hawks can be spotted almost everywhere in the lower 48 states. 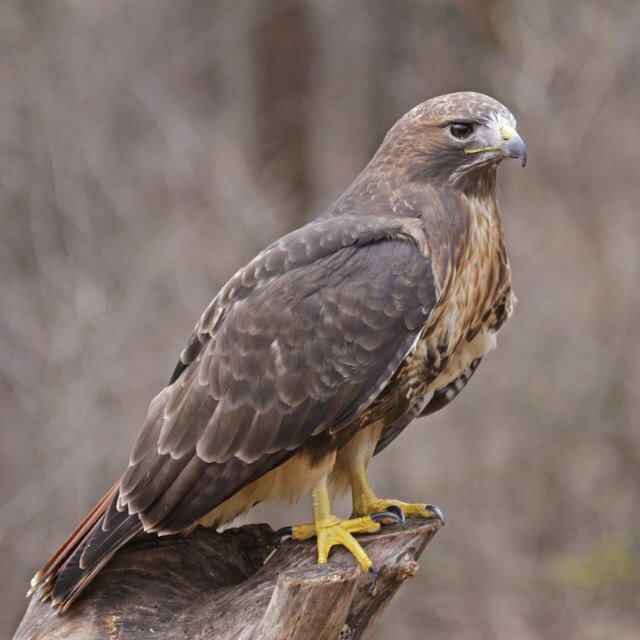 Some hawks are named for some distinctive visual characteristic, making them easy to identify, like the red-tailed hawk, red-shouldered hawk, gray hawk and black hawk. This isn't always reliable, though. The Cornell Laboratory of Ornithology describes several color variations in red-tail hawks, depending on gender, age and location. Juveniles can have banded tails, and the rufous variants have reddish-brown chests and bellies. Buteo hawks like the the red-shouldered hawk tend to have broad wings and short, fanned tails. They're usually larger then the accipter hawks like the goshawk, which have shorter wings but longer tails. Hawks hunt on the wing, and their various flight habits can provide clues to their identification. The Annenberg Learner's Journey North site describes how hawks can spot other hawks circling in a thermal, and join them to catch the same ride. This can lead to the formation of a large group of circling hawks, called a "kettle." Hawks in the genus Buteo, like the red-tailed hawk, will hunt by soaring on rising thermals with few wing flaps. They glide steadily instead of rocking side to side like a turkey vulture. Hawks in the genus Accipter, like the goshawk, fly fast with agility to surprise their prey. Rather than soaring, they tend to fly straight with a few wing flaps followed by gliding. The soaring Buteos prefer open areas with low vegetation, like the rough-legged hawk, which breeds in the treeless northern tundra. Many, like the red-tailed hawk, will soar and circle to watch for the movement of prey below. The smaller Accipiters like the sharp-shinned hawk prefer a dense forested habitat where they can ambush prey with fast and agile hunting among the trees, sometimes catching other birds in flight. Silbajoris, Alex. "How to Identify North American Hawks." Sciencing, https://sciencing.com/identify-american-hawks-2041155.html. 24 April 2017.